View More In Single-Serve Brewers. SAFE, COMPACT & PORTABLE: This lightweight, ultra slim, 1-cup coffee machine barely uses counter space. 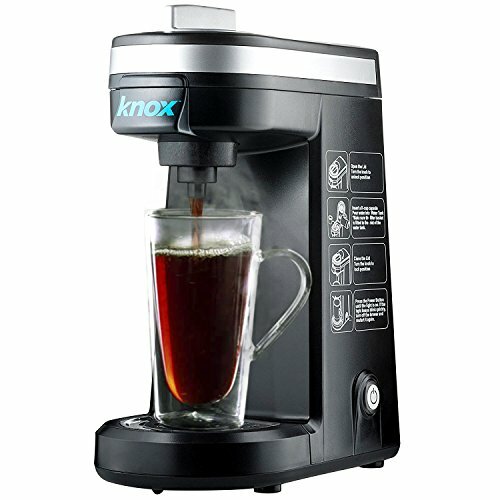 Ideal coffee maker for offices, small kitchens and travel. Auto shut off and lock knob keep it safe. FITS ANY SIZE K CUP: Our pod holder is large enough to accommodate any standard-sized k-cups, so you can prepare your favorite flavor from almost any brand. It can also brew espresso shots. SUPERIOR COFFEE: Our patented brewing technology uses 4 water jets instead of one dripper to evenly soak coffee grinds for a smoother brew. Prepare up to 12oz of coffee in 3 minutes or less. PURE TASTE: A filter basket fitting into the top of our water tank filters your water before coffee brewing, unlike other models in which water goes directly into a reservoir. Sip cleaner coffee! RELY ON KNOX: Knox Gear is dedicated to developing creative and innovative lifestyle solutions at a budget friendly cost. We back our products with a 1 year warranty. Knox: Fortify the Everyday. If you have any questions about this product by Knox, contact us by completing and submitting the form below. If you are looking for a specif part number, please include it with your message.